Specially-designed for Palm users, 4Easysoft Palm Video Converter brings all the capabilities to double your pleasure of enjoying movies and music on any Palm devices by converting mainstream video and audio formats to Palm AVI, including WMV, MPEG, MPG, ASF, MOD, FLV, SWF, RM and HD files, etc. This Palm Video Converter has so powerful converting function that it supports all Palm devices, such as Palm Treo, Palm Pre, etc. As versatile Palm Treo Video Converter, you can make a creative video by effecting, trimming, joining, cropping, watermarking. Then enjoy it or share it with your friends. MP4, MOV, M4V, AVI, FLV, SWF, 3GP, 3G2, MPEG, MPG, ASF, WMV, MOD, TOD, MKV, RM, MPV, DV, DIF, TS, MTS, etc. 4Easysoft Palm Video Converter supports palm devices such as Palm Pre, Palm Treo Pro, Palm TX, Palm Treo, Palm Zire, Palm Tungsten. Adjust video Brightness, Contrast, Saturation and audio Volume. Avoid mosaic by checking Deinterlacing. Split movies by setting the exact start and end time, or just drag the slider bar when it play. 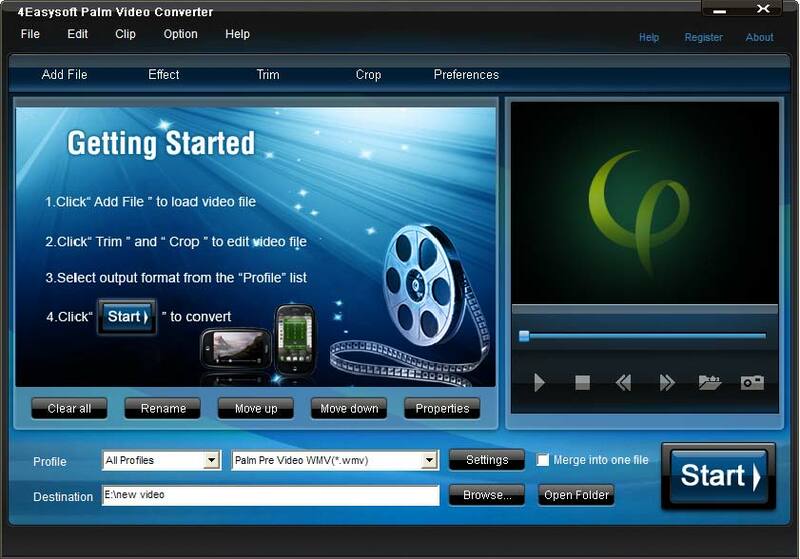 Frame the video play region that you want using this Palm Pilot Video Converter like the smart scissors. Capture your favorite pictures while previewing movies. It can be saved in default folder automatically. Preview both the source video and converted video simultaneously while editing to get the best movie effects. Add text and picture you like as watermarks then set watermark Transparence, Vertical position and Horizontal position even text font style, etc. With professional video encoding and decoding technique, 4Easysoft Palm Video Converter brings you the advanced and high speed converting process. On the other hand, this Palm Centro Video Converter has the magic charm to impress users with best video quality. How to put video on Palm devices?